The world of micro-organisms can be a cut-throat one. Minute grazers are under constant threat from minute predators. It can be an existence red in tooth and claw or, in the case of today's subjects, haemolymph-covered in chelicera and grasping seta. The domestic cheyletid Cheyletus eruditus, from here. 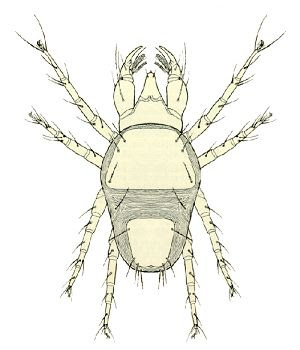 The Cheyletini are one of fifteen tribes recognised by Bochkov & Fain (2001) in the mite family Cheyletidae. Cheyletids are small mites, generally less than half a millimetre in length, that are close relatives of the follicle mites seen on this site previously. Many cheyletids (including most Cheyletini) are, nonetheless, voracious predators of other mites. Other members of the family live as parasites on birds or mammals. In the past, such parasitic forms were recognised as a distinct family Cheyletiellidae but it is now recognised that they are descended from predatory ancestors, possibly on more than one occasion. Predatory cheyletids are not to be sniffed at: the Hemicheyletia wellsina nymph on the left has managed to bring down another much larger predatory mite Metaseiulus occidentalis. Copyright Haleigh Ray. The Cheyletini can be considered representative of this ancestral form; indeed, as members of the tribe are distinguished from others in the family solely by their retention of features likely to be primitive, it is likely to be non-monophyletic (Bochkov & Fain 2001). Cheyletini have more or less oval or oblong bodies with moderate-length legs, shorter than the length of the body, all tipped by a claw. The gnathosoma (the front section of the body bearing the chelicerae and palps) is well developed and generally makes up a full third of the body length. The palps are the real business end of a cheyletin, though. In many groups of prostigmatic mites, the last segment of the palp (the tarsus) is offset from the main line of the appendage and opposed to a large claw at the end of the tibia, the two of them together functioning to grab whatever the mite wishes to grab. Predatory cheyletids have the tibial claw and offset tarsus but the tarsus also bears a number of intimidating enlarged, claw-like setae that add to the mite's grabbing power. In the Cheyletini, there are four such setae at the end of the tarsus, a pair of comb-like setae dorsally and a pair of sickle-shaped setae ventrally. The mite will generally sit in place, motionless, with its palps held open. Should a potential prey animal come close enough to the predator, the palps will swing together and the prey will be caught. Cheyletini are diverse in habitat. Many genera are free-ranging hunters on trees but others show preferences for more constrained locales. In particular, a group of genera centred around the type genus Cheyletus includes species living in the nests and burrows of mammals and birds. Most of these species benefit their hosts by hunting down potential parasites and the like or cleaning up organic residue. One genus, Cheletophyes, is found in the nests of carpenter bees Xylocopa and can actually be transported between nests by the host bee in special pockets on the thorax called acarinaria. However, it is not that big a step to take from feeding on shed organic particles in the host's nest to feeding more directly on the host itself and this is presumably how some cheyletids made the switch to parasitism. One member of the Cheyletini, Pavlovskicheyla platydemae, is an ectoparasite of tenebrionid beetles, attaching to them in spots concealed beneath the host elytra (Walter et al. 2009). 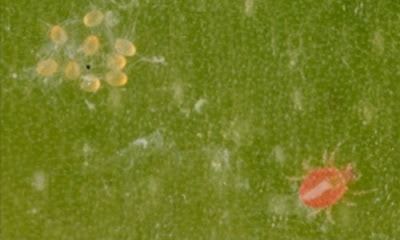 Female Hemicheyletia wellsina patrolling near her batch of eggs (in the upper left, under a protective silk covering she has woven for them), copyright Haleigh Ray. 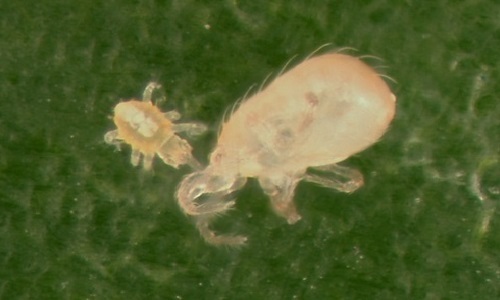 Other Cheyletus species are known from human-associated habitats such as in houses or grain stores where, again, they are usually considered a net benefit due to their controlling effect on pests such as dust mites or flour mites. Indeed, the common species Cheyletus eruditus has been commercially marketed for control of stored product pests under the name Cheyletin. Females of this species in domestic habitats lay their eggs in crevices or other such concealed spaces and remain to guard their brood, driving away other animals that may pose a threat. However, hatching offspring need to disperse quickly, as if they hang around the nesting site too long they may be eaten by the mother herself (Walter & Krantz 2009). Bochkov, A. V., & A. Fain. 2001. Phylogeny and system of the Cheyletidae (Acari: Prostigmata) with special reference to their host-parasite associations. Bulletin de l’Institut Royal des Sciences Naturelles de Belgique, Entomologie 71: 5–36. Walter, D. E., & G. W. Krantz. 2009. Oviposition and life stages. In: Krantz, G. W., & D. E. Walter (eds) A Manual of Acarology 3rd ed. pp. 57–63. Texas Tech University Press. Walter, D. E., E. E. Lindquist, I. M. Smith, D. R. Cook & G. W. Krantz. 2009. Order Trombidiformes. In: Krantz, G. W., & D. E. Walter (eds) A Manual of Acarology 3rd ed. pp. 233–420. Texas Tech University Press.